F. M. Alexander was born in Tasmania, Australia, (the F is for Frederick and the M is for Matthias). At an early age he developed a love of the theatre, the spoken word and acting. While giving recitals he developed a problem with his voice. A tendency to become hoarse and even lose his voice while performing. When he found the medical profession could not help him he began to explore his own "use", ("use" here applies to the whole person. i.e mind and body). He worked on the assumption that his "use" is a factor regarding the way his whole body functions. After a great deal of observation and experimentation he gradually acquired the skill of consciously choosing not to follow his usual, habitual way of "using himself". He learnt to 'direct' himself in a way which enhanced his whole self. His voice began to improve and he was able to continue recitals. He was able to teach others this skill or technique and found it applicable to a diversity of conditions and situations. 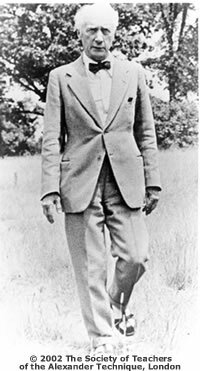 He came to England in 1904 and taught the method successfully in London and also in the U.S.A.
Bernard Shaw, Aldous Huxley and John Dewey where among a host of famous people who were helped by Alexander and he had quite an influence on physicians and educationalists. He wrote several papers and four books about his Technique. Alexander continued to work at teaching his method of re-education until his death in 1955.